We received copies of the book from the publisher. Today we are pleased to take part in the Emmanuel's Dream blog tour and book giveaway! Laurie Ann Thompson introduces readers to Emmanuel Ofosu Yeboah's inspirational story in this picture book biography. Emmanuel grew up in Ghana and was born with only "one strong leg." Through the encouragement of his loving mother, Emmanuel learned to walk on crutches, ride a bike, and attended school. When his mother fell ill, thirteen year-old Emmanuel traveled to the city of Accra where he worked at a food stand and shined shoes to help support his family. Determined to prove to his country that he could accomplish great things, Emmanuel rode a bicycle 400 miles across Ghana. "He proved that one leg is enough to do great things- and one person is enough to change the world." CATHY'S THOUGHTS: Emmanuel is an amazing individual and role model for children and adults. I can't believe I hadn't heard his story before. Emmanuel's Dream is a book that teachers and parents will want to read and discuss with children. The narrative writing is accessible to young readers who want to read it independently, too. Sean Qualls' bold illustrations in orange and blue hues will appeal to kids. Don't miss the author's note at the end of the book where Thompson provides more information about how she learned about Emmanuel and about his scholarship fund for children with disabilities. Emmanuel has also worked with leaders in Ghana to pass laws protecting the rights of people with disabilities. I would pair Emmanuel's Dream with The Boy Who Harnessed the Wind and focus on the themes of determination and overcoming obstacles. LOUISE’S THOUGHTS: I love everything about this book. From the artwork to the text, Emmanuel’s Dream is truly a must read for everyone. Quall’s mixed media illustrations capture Emmanuel’s strength and determination. They pair perfectly with Thompson’s rich language that packs in lots of information about the incredible obstacles Emmanuel overcame. Not just physical obstacles, but attitudes regarding people with disabilities as well. Emmanuel’s dream of cycling around Ghana to change the perception of those with disabilities is such an important message for children to hear. It took Emmanuel ten days to ride four hundred miles. At the end of his journey, Emmanuel became a national hero. To see Emmanuel talk about his journey, watch this video produced by Smile.tv. Laurie Ann Thompson is the author of Be a Changemaker: How to Start Something That Matters, a how-to guide for teens who want to change the world. An advocate for social justice, Laurie is dedicated to inspiring and empowering young readers. Emmanuel's Dream is her picture book debut. Visit her at lauriethompson.com. A curriculum guide for Emmanuel's Dream is available here. Be sure to visit the other stops on the blog tour. 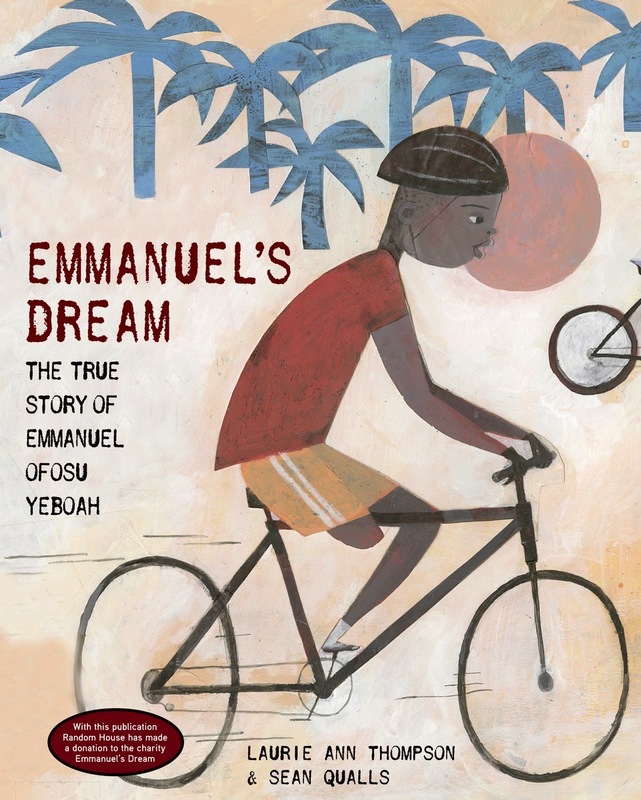 One lucky winner will receive a copy of EMMANUEL’S DREAM: THE TRUE STORY OF EMMANUEL OFOSU YEBOAH by Laurie Ann Thompson, illustrated by Sean Qualls. Complete the form below to enter the giveaway. You must be 13 years old or older to enter. Entries will be accepted until Sunday January 25th at 11:59 p.m.
Congratulations, Laurie on this amazing book! !